On Turn: Washington's Spies Season 4 Episode 5, it looks like Abe’s mission may already be over. His dual alter egos -- Colonial Spy Culper and British Pvt. Woodhull -- clash in the office of the new Head of British Intelligence before Abe could exact revenge on Col. Simcoe. Let’s back up. This wasn’t a very good plan to begin with, right? Abe knew going in that certain people in New York could identify him as a sympathizer to the American cause. But this farmer from Setauket has proven to be a fearless double agent, and this mission is personal: to kill Col. Simcoe. After charming Gen. Benedict Arnold with his revenge rhetoric in order to join the American Legion, Abe quickly learns about the inner workings of the British army. Pvt. Woodhull (trying to convince Arnold to let him join): Providence spared me so that I could stand before you today and seek revenge. Gen. Arnold: And you shall have it. Permalink: And you shall have it. Abe’s new friend and bunkmate is under the impression that the American Legion is the safest regiment in the British forces. We are never going to see battle. Permalink: We are never going to see battle. Abe certainly doesn’t feel safe when he practically comes face-to-face with Simcoe on Day 1 of training. But does Simcoe (with just half an ear, thanks to Abe’s wife Mary) recognize Abe in the Red coat toward the back of the formation? Pvt. Woodhull proves to be quite popular with the other British officers, as he is summoned by Col. Cooke to the pub and later to Kennedy House to meet Gen. Clinton. I've come to see Benedict Arnold and get justice. Permalink: I've come to see Benedict Arnold and get justice. The brass seem to believe that Abe’s should be working the land back on Long Island, instead of enlisting as a lowly private in the British army. Soon Gen. Arnold realizes that the good farmer has friends in high places. Gen. Clinton (to Arnold): If he gets himself killed, it's your fault. Arnold: I'll be personally responsible for Woodhull's safety. Permalink: I'll be personally responsible for Woodhull's safety. Peggy attended the party at Kennedy House too (yes, they are having a party in the middle of a war) and the best spy on either side now knows Abe is passing along information about her husband. Why wouldn’t she run and tell her husband? Because she despises him, of course, and she can probably trade on that information for her own use later. By the way, I continue to be fascinated by 18th-century bathroom rituals. Pregnant Peggy just happened to duck into a the same room to do her business where young Cicero passed along his first bit of intel? Any old spot to pop a squat will do? I guess that’s better than a few episodes ago when the hallway was sufficient. Back in New Windsor, Anna’s estranged husband, Selah, arrives at the camp after Anna wrote to him regarding the conditions for soldiers. Selah is now a Congressman who may be able to influence the war budget and prevent another mutiny. Before leaving camp, Selah sweetly asked his wife to return to Philadelphia with him. Also, Maj. Tallmadge obviously wants her to stay in the camp and it’s cute. Back in New York, Simcoe makes a reference to his “old friend from Setauket” who isn’t fit to wear a uniform. Is he talking about Abe? Maybe not, as two other Setauket suspects emerged: Robert Townsend, aka Culper Jr., and Maj. Edmund Hewlett, whom we thought we’d never see again after last season. 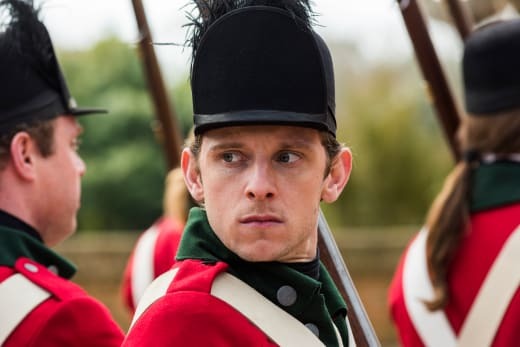 I’m elated that Edmund has returned this season, but I hope he hasn’t turned into another Simcoe -- seems like we have plenty of villains already. The tension built nicely throughout this episode and culminated with the final scene when Abe came face-to-face with Maj. Hewlett. Permalink: Why don't you take a seat. Abe has double talked his way out of sticky situations with Maj. Hewlett before, but this time a presumably more jaded Hewlett is the Head of British Intelligence -- and he already knows that Abe is a Continental spy. This episode leaves us with so many questions heading into the home stretch of the final season: Will Abe be able to escape New York? Will his friends mount a rescue mission? What will Peggy do? Will Anna choose a man already? 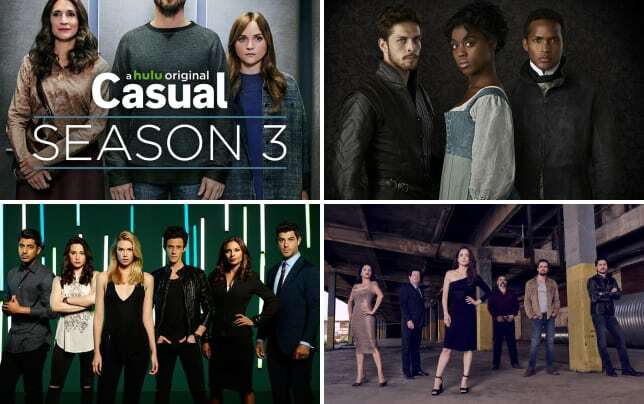 Have you missed any episodes this season? 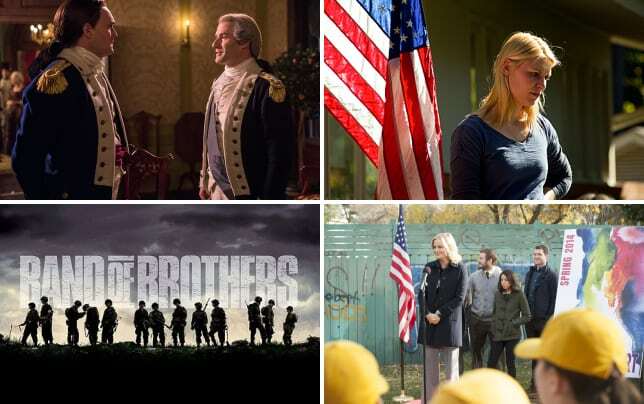 No problem, you can watch Turn: Washington's Spies online.